WTF: Why Is There an Appliance Store in a Victorian-Era Home in Shelburne? Frequent travelers through Shelburne have likely noticed the large white house on the west side of Route 7 between the Pierson Library and Village Wine and Coffee. The slate-roofed former private home, not far from the Shelburne Country Store and the Heart of the Village Inn, seems a likely candidate for an art gallery, real estate office or bed-and-breakfast with its own line of jams, maple syrup and crocheted pot holders. Instead, signs on the shaded front lawn and mounted on a rusty, slightly askew post read, "Hotpoint Quality Appliances" and, below that, "New Idea Electric Tractors." Most Vermonters associate Shelburne with its eponymous museum, picturesque Shelburne Farms and an enviable tax base of luxury homes with breathtaking Adirondack views. It's not exactly a mecca for those seeking front-load washers and rider mowers. So what's the store doing there? Just ask Norman Marcotte, founder and owner of Marcotte Appliance. At 83, Marcotte has been selling Hotpoint and General Electric appliances and Clay Farm Equipment at the same location since 1959. That's the year he and his wife, Rita, moved into the 13-room house, previously the home and office of a local dentist. And, though it may seem like a less-than-ideal place for peddling refrigerators, freezers, stoves and dryers, Marcotte says he's never found a reason to leave. "Moving was never an option for us," he explains, "because we were in the center of town and building up a business pretty rapidly." The interior serves as the home, showroom and workshop for three generations of Marcottes who are now in the family business. It doesn't appear to have changed much over the years, aside from the addition of two desktop computers. The front office is still wood paneled, with shelves containing decades-old stacks of paperwork, catalogs and a pink crocheted recipe box that resembles a 1950s-era Hotpoint range. Even the punch clock for Marcotte's four employees looks antique. That view contrasts with the ultramodern washers, dryers and AC units on display downstairs in a showroom that was once a woodshed. Behind it, another showroom contains refrigerators and freezers. In another era, that room served as the carriage barn and horse stalls; an adjacent storeroom was a chicken house. Among the contemporary models sits a vintage Hotpoint range from 1931, in mint condition. "Same year I was born," Marcotte notes. Someone once offered him $5,000 for it, but he wasn't interested. This 1895 house is full of the Charlotte native's history, too. Marcotte rummages in his desk in the front parlor and finds a copy of the blueprints for a 100-foot-long barn he built as a teenager; it still stands on Carpenter Road in Charlotte. Marcotte was 14 when he designed it, he says; he finished the first floor at 18 and the second floor and roof at 21. Marcotte's mechanical abilities got him noticed at a young age. At 18, he sent letters to three different farm equipment companies expressing an interest in selling their products. When all three wrote back, Marcotte chose the one he wanted to work for: Clay Farm Equipment of Cedar Falls, Iowa. Marcotte has stuck with the company for more than 60 years, through several changes of ownership. In 1986, Marcotte Appliance was Clay's second-largest dealership in North America. Today, farmers still call or even visit Marcotte's business from as far away as Iowa, Wisconsin, Michigan, Minnesota and Washington State to buy farm equipment and parts for their milking parlors, belt feeders and "honey wagons," aka manure tankers. "Why move?" Marcotte asks rhetorically. "They find me." 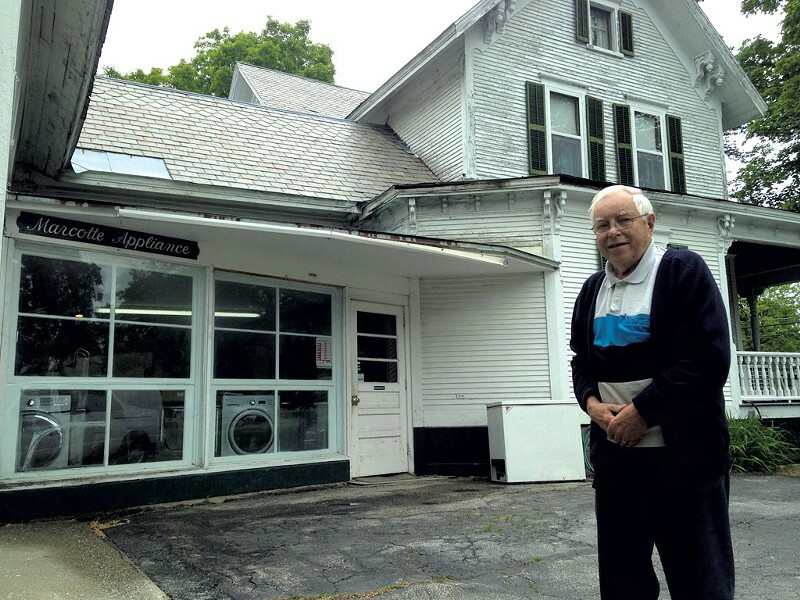 Many Vermonters seek out his appliance store, too — the larger side of the business. Marcotte began selling Hotpoint products at age 21 and later added a line of GE appliances. In 1958, a representative from Hotpoint took Marcotte's photo in front of his Shelburne store and sent it to every Hotpoint dealership in the United States. "So I was a big influence on Hotpoint even back then," he boasts. "They treated me as one of their better dealers." As Hotpoint and GE grew, he adds, "We grew right along with them." Some might wonder how a tiny, independent store can compete with big-box retailers, given that Marcotte barely spends anything on advertising and is located in a mostly upscale neighborhood with little signage. As the octagenarian founder explains, he still goes to work every day, services much of the farm equipment himself (when his knees allow it, he confides) and offers his customers things they can't find elsewhere. Shelburne resident Nicci Micco says that when she and her husband, Jon Olin, "inherited a stove full of mouse nests," Marcotte's staff was there to help. Ditto when their fridge suddenly died and their washer went off-kilter. "When we told them we needed to build an alien spaceship [for the kids], [Marcotte's staff] invited us to stop on by any time," Micco adds via email. "When I did later that afternoon, Taylor [Marcotte] dropped what he was doing (mowing the grass) to help me find a nice, big fridge box in the garage, and sent me on my way with a smile. I love Marcotte Appliance." Norman Marcotte says stories like those keep him in business. "The big-box stores never really hurt us because they couldn't do what we were doing, which was taking care of people properly," he says. "If you have a good dentist, you're not going to go to some joker down the road just because he's $5 cheaper."